Die has a pilot hole (.249" min. 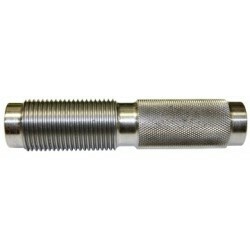 to a .251" max diameter) and is threaded on the bottom, knurled on top. This is the same style die as used by RCBS and other manufactures. 7/8" x 14 Thread. Die blanks allow you to cut a die for a custom chamber dimension or to create a new die for a wildcat cartridge. They must be reamed with a die reamer (sold separately) and are pre drilled with a pilot hole. Standard 7/8 x 14 threads to fit most popular reloading presses.